We are highly appreciated as manufacturer and supplier of different types of commercial signs and signages which are very used for introducing products or services of a company. These are developed from fine technology and are perfectly powder coated. These are weather and wear and tear resistant and are known for high durability and excellent usage. Fire Safety Sign is photoluminescent signs which glow in dark without electricity or batteries with only the exposure to a bright light or UV light source. 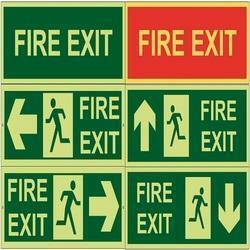 These safety signs are used at subways, railways, airports, hospitals, malls, buildings and several other places. 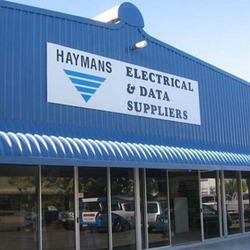 We are reckoned amongst the customers for manufacturing and supplying bulk of Indoor Factory Signages. Our products are highly acknowledged amongst the clients for their excellent performance and high grade quality. We offer them to our esteemed clients after testing them on several parameters to ensure their correct delivery. We provide products to our clients at market leading prices. 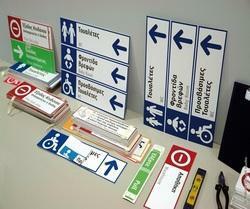 We are offering various sorts of out door signs, out door factory signages, reader boards, etc. as per requirement. These are developed with the help of high quality vinyl graphics, graffiti resistant powder coat paint and fine technology. We offer them in different sizes, shapes, designs, patterns and colours. We charge industry leading rates. 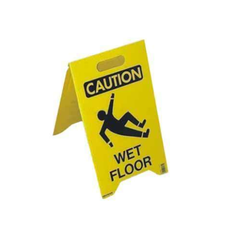 Floor Safety Sign offered is made available in PP material finish and provide for durable and portable usage.